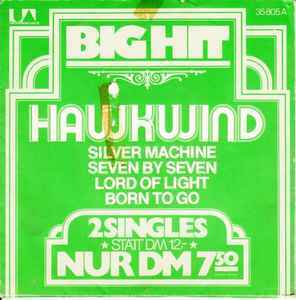 The records are identical in every way to the original two German 7" releases of these singles: 35381 (Silver Machine / Seven by Seven) and 35492 (Lord Of Light / Born To Go). Same matrices, same labels, same run offs. "Silver Machine" Live At The Roundhouse Feb. 13th, 1972. "Seven By Seven" Recorded at Rockfield, Monmouth. "Lord Of Light" produced by Hawkwind (Dave & Del) at Rockfield Studios, Monmouth, Sept/Oct. 72. Remixed by Peter Kramper and Stefan Michel at Bavaria Studios, Jan. 73. On 35381 (Silver Machine / Seven by Seven), producer Dr. Technical (ANV for Dave Brock) is spelled "Dr. Technichal".